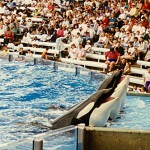 SeaWorld IPO documents show a company deep in debt and reveal some interesting stats about how they do business. Alaskans ban taser use on moose and bear, fearing a non-existent epidemic of “no kill” hunts. Hunting groups hate “catch and release” hunting, fearing it would debase hunting. 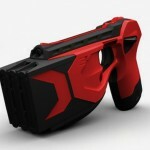 TASER International, Inc. introduced a $2,000 wildlife taser that shoots $25 probes 35 feet into bear, lion or moose. Some animal lovers groan, but I think it may actually help save animals. 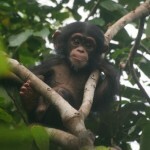 Chimps in Guinea show each other how to disable the snares set by bushmeat trappers. Now if they can teach other African chimps, which suffer horrible injuries from the snares. 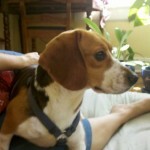 After one month with the rescued beagles, they know their names, what foods they like and who their parents are. Less clear on what is inedible. 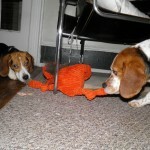 One of the biggest challenges of raising former laboratory beagles turns out to be preventing escape. Two NC dogs ran away and got hit by cars. 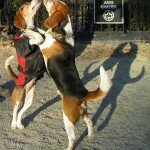 Huck and Moxie are becoming well-known in the East Village for their rassling and sweet greetings. 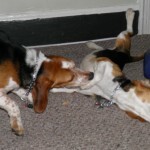 This weekend my husband David and I adopted two of the 200 beagles sprung from a NC medical research lab shut down after Peta produced and unwatchably disturbing undercover video that shut the lab down.